But looks like the tables have turned. The company released Mi Bluetooth Audio Receiver that will allow to connect Mi 6 or any other 3.5-mm-jack-less smartphone or audio source, using just the device’s Bluetooth settings. Mi Bluetooth Audio Receiver is equipped with a 3.5-mm jack and a Bluetooth chip in a version 4.2. What you do is plug your headphones into the jack and just enjoy a wireless audio streaming while carrying this device clipped on your bag or T-shirt. The receiver has a signal range up to 10 meters and a rechargeable battery that offers 4 hours of battery life on average when it is being used in the receiver mode. It can go even longer than that in the dormant mode. You do not need a special application on your smartphone or other gadget to activate the device. Mi Bluetooth Audio Receiver syncs with the smartphone via Bluetooth after you press the corresponding button on the receiver. 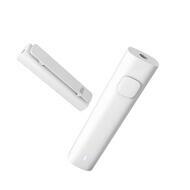 As mentioned previously, the receiver can be clipped on your clothes with a help of a latch. You can also keep it in the pocket of your jeans if the length of the headphones’ cord allows. All of this convenience comes in a housing made of qualitative plastic. If you have grown pretty close to your 3.5-mm headphones and there is no chance you replace them with wireless ones, Mi Bluetooth Audio Receiver knows how to solve the dilemma.